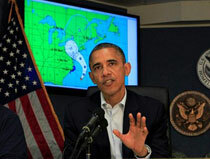 Hurricane Sandy, a true "October surprise" if there ever was one, will illustrate the advantages and disadvantages of incumbency as President Barack Obama balances emergency response and campaigning in the next week. Hurricane Sandy, a true “October surprise” if there ever was one, will illustrate the advantages and disadvantages of incumbency as President Barack Obama balances emergency response and campaigning in the next week. The president recused himself from the campaign trail on Monday to monitor the storm from Washington DC. With only a week left before Americans go to the polls, the federal government's response to the hurricane will be highly scrutinized. If FEMA and other government agencies respond brilliantly, it may help Obama with undecided voters who may not be happy with the slow economic recovery, but think he's demonstrated strong leadership in a crisis. If the government is slow to help or Obama has a “heck of a job, Brownie” moment, it might serve as a knockout blow for Republican candidate Mitt Romney. The evolving situation is a great illustration of the power an incumbent candidate has during a reelection campaign. Aside from the powerful imagery of Air Force One and Marine One at campaign stops, the president can demonstrate strong leadership during a crisis situation in a way his rival cannot. Romney has some advantages himself, aside from momentum from a strong first debate performance. For one, running for president is his only job at the moment, and he can dedicate himself to campaigning while the president is absent from the trail. Former President Bill Clinton may be a campaign subordinate extraordinaire, but even he can't truly replace a sitting president making his own case for another term. However, Romney, too, must be very careful with his message. A month after he was criticized for quickly calling a press conference after four Americans were killed in Benghazi, Libya, to criticize the president, Romney will have to avoid appearing like he is gloating if the government responds slowly. And Romney's team will want to avoid creating a split-screen image of him campaigning while millions of Americans are digging out after the storm. With Ohio and other swing states still up for grabs, the final week of the campaign just became an even more delicate dance for both candidates.